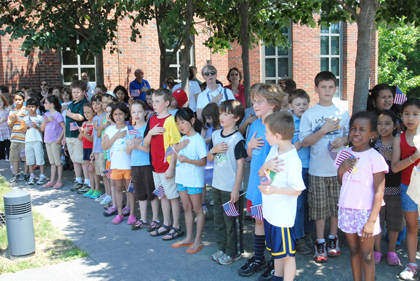 SECOND GRADERS HONOR THE FLAG: Community Park second graders brightened up Fridays Spirit of Princeton Flag Day ceremony on the plaza of the Princeton Township Municipal Building. Though Flag Day officially fell on Saturday, June 14, the Spirit of Princeton held the celebration on a school day so that students could participate. Members of Borough Council voted 5-1 to approve the set of contract estoppel agreements with its developer when they met in public session last week, June 10, despite concerns by one member that the legal documents make no mention of start or finish dates. At a recent meeting of the Princeton Historic Preservation Commission (HPC), member Elric J. Endersby expressed concern about the Valley Road Building, where it appears that little or no maintenance is being done. He wondered if this neglect was a deliberate effort to force the tearing-down of the building, parts of which date back to 1910. The building currently houses the Princeton Regional School Boards administrative offices, as well as Corner House Counseling Center, the Princeton Township Affordable Housing office, Princeton Young Achievers, and Princeton Community Television (TV 30). Borough resident Kristina Johnson was unsuccessful in her attempt to alter plans for a sidewalk to be constructed outside her home on the corner of Cleveland Lane and Lafayette Road. A medal can be a work of art, observed Alan Stahl, Princeton University Librarys Curator of Numismatics, recently. It can also be pretty trashy and commercial. With its nobler aspects in mind, Mr. Stahl, who was just named a 2008 Guggenheim Fellow, is hoping to encourage university president Shirley Tilghman to begin the practice of issuing medals to mark special university events such as endowment campaigns. The Minority Education Committee watched and discussed a documentary movie about race relations at its Monday evening meeting, giving it a two-thumbs up, and recommending that it should not only be used in the Princeton Regional Schools, but should be required viewing for municipal officers and members of the Chamber of Commerce as well. Sasha Sherry knows what its like to excel on ice hockeys international stage. Chris Sailer came home a few weeks ago to find a Federal Express package unexpectedly lying on her doorstep. Bennett Murphy realized he was a long shot when he tried out for the Providence College mens lacrosse team in the fall of 2003.